You’ll find no better example of someone who uses her own personal energy and enthusiasm to bring out the best in her dogs. I’ve never seen anyone get so much drive and enthusiasm from a dog, yet still maintain absolute perfect precision. Bridget is truly a gifted trainer like none other. Most of us mere mortals would kill for the talent Bridget displays in her Youtube videos. With over 30 years of training experience, she has put over 100 titles on her dogs from the sports of Obedience, Field and Agility. Her accomplishments include 7 Obedience Trial Champion (OTCH) titles, 10,600 lifetime OTCH points, over 225 High in Trial (HIT) awards, over 225 High Combined (HC) awards, and multiple perfect 200 scores in both Open and Utility. She has the first and only Obedience Trial Championship (OTCH) on a Norwich Terrier, “Hemi”. Bridget and her Golden Retriever “Soupy” also won a placement while representing the United States in international obedience competition at Crufts in England. She has had at least one dog (and sometimes two) ranked in the AKC Top 25 All Breed Obedience Dogs in 2002, 2004, 2005, 2006, 2007 and 2008. In 2015, Bridget’s Golden Retriever, “Saucy” was the AKC National Obedience Champion. She is also an accomplished field trainer putting Master Hunter (MH) titles on five dogs. Bridget has produced several instructional videos for those looking to compete with their dogs, available at her web site. Any time we needed to make a point, the name, “Bob Campanile” would come up as the Michael Jordan of dog trainers: The best of the best. Cripes… most of us didn’t even know who Bob Campanile was. I certainly didn’t. The name just represented some guy on the East Coast who had won all of the big working dog competitions… again and again and again. But if you wanted to make a point, the name “Bob Campanile” might as well have been, “Jesus Christ” if Jesus Christ had been a dog trainer. It turns out that Bob Campanile is still at the top of his game, all these years later. And believe it or not… he’s also a heck of a nice guy. One of the big regrets in my dog training career is that I missed the opportunity to get to know Ivan Balabanov– before he became a dog training god. That was back when he was “just” working as an animal behaviorist at the San Francisco SPCA. And before he became an international celebrity amongst professional dog trainers; before he became a two-time world champion and before his name became practically synonymous with the Belgian Malinios. The Belgian Malinois breed is quickly replacing the German Shepherd Dog as the working dog of choice for police and military applications. 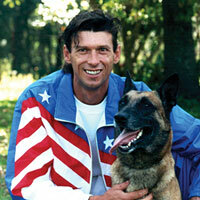 Anybody who knows anything about the Belgian Malinois, knows about Ivan Balabanov. I was a young dog trainer living in the East Bay at the time. I remember calling the SPCA and talking to another trainer who told me about Balabanov. Sure, I thought. Everybody’s got their favorite guru and everybody’s guru is, “The best.” I figured that he might be one of Karen Pryor’s clicker trainers because he was working for the SPCA. And what’s up with that weird name? Probably just another Northern California nut who dances naked with his dogs in Golden Gate park, I thought. Well, no. The guy with the funny last name would later turn out to be a legend within sport dog training circles. And yes… I do feel like an idiot for missing out on my opportunity to meet a guy who would go on to become one of the greatest sport dog trainers… ever. Ten (10) times National Champion. Two (2) times World Champion. Award winning author of the book Advanced Schutzhund and DVD series Obedience without Conflict. Has appeared on Animal Planet, Fear Factor, and pretty much all dog sport magazines around the world. Lectures at the annual United States Police K9 Association Events and is a trainer for ATF special task force K9 units. Instructs and lectures some of the top Search and Rescue organizations in the US as well as Switzerland. Worked as a Guide Dog instructor for 5 years in California where he trained more than 300 dogs and students. Worked as animal behaviorist at the San Francisco SPCA (a “no kill” facility) and was responsible for the successful evaluation and rehabilitation of some of the most difficult cases. Founder of the SF/SPCA Dog Trainers Academy. He also went on to write and teach the training curriculum. If you’ve seen the films, “Water For Elephants” or “The Artist” — then you’ve already seen the magic of Omar Von Muller’s dog training abilities. Or how about “Jumpy” the Australian Cattle Dog in the video (see below) that was viewed over eleven million times on Youtube, last year? Yup, that’s Omar Von Muller’s work, too. He has hundreds of credits to his name including the motion pictures, “The Italian Job”, “Four Brothers”, “Jackass 3D” and “Water for Elephants”. But his greatest accomplishment may have been training the role for Uggie– the Jack Russell Terrier in the Academy Award winning film, “The Artist”. That role received several awards worldwide. Uggie became the first dog to have his paw prints on the Hollywood Walk of Fame. Way before the internet, I remember getting my hands on a VHS tape of a dog trainer instructing a German Shepherd Dog to swim across the narrow part of a river and bite an agitator (the guy who wears the padded sleeve when training police dogs). Then the dog was remotely instructed to immediately release his bite and return to the handler– by once again swimming across the river. And that was probably twenty-five years ago. You can imagine the level of training Rodney Spicer is doing, now. I have tremendous respect for Rodney Spicer’s training. He is the real deal in a field of less-than-impressive operators. Whenever I get a client who has a serious need for a personal protection dog, Rodney Spicer is usually the guy I send them to talk with. Forget about the clowns selling big, fluffy dogs in the back of Robb Report magazine. When the rubber meets the road, Rodney is the guy you want to see. And while I haven’t had the opportunity yet to meet him personally (we’ve communicated in the past via email) he engenders the utmost respect from all of the top trainers in the working dog field. Duke Ferguson got his start in dog training when he adopted a Labrador Retriever– and the dog almost killed him! After consulting with a number of local dog trainers (all of whom told him to euthanize the dog!) he got his hands on a copy of my book. As soon as he began directly addressing the issue by correcting his dog’s aggressive behavior–rather than merely throwing hot dogs at the dog– he started getting incredible results and was able to save the dog’s life. That started Ferguson on a path to learn more. As he continued to acquire more knowledge, his skill level just kept getting better and better. It wasn’t long before Ferguson had earned himself the respect and admiration of other professional dog trainers both in Canada and in the United States. He won ribbons and got press. Soon, other dog lovers came to learn his approach to dog training. He now owns four dog training locations and is doing brilliant things with dogs. In addition, he is a fantastic communicator with the ability to teach not just the dogs but their owners, too– a rare commodity these days. For Tyler Muto, it’s all about Dogmanship. Tyler Muto, a Rochester, NY native, has had a life long passion for training dogs. Upon moving to Buffalo, NY in 2007, he began researching the local dog training facilities, looking for a place to apply his knowledge and skills, and was instantly dissatisfied with the services available to dog owners in the area. 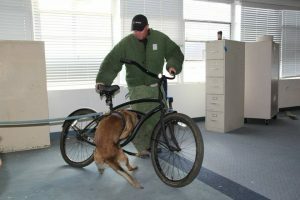 With few resources, and with no local connections, Tyler decided to start his first company, K9 Connection, and offer a behavioral service that was previously unavailable in the Buffalo region. In 2013, Tyler was elected to serve on the Board of Directors for the International Association of Canine Professionals, and was almost instantly promoted to fill a seat as the organization’s Vice President, the youngest ever to be granted this honor. Tyler was also picked by the Buffalo District Office of the U.S. Small Business Administration to receive an award for Young Entrepreneur of the Year. Today, dog owners from all over the United States and Canada bring their pets to Tyler for training. Tyler’s passion for training, along with his ability to help families and dogs achieve harmony, is unparalleled, and has earned him recognition as not only one of the best in Western New York, but one of the most sought after trainers throughout the United States and Canada.